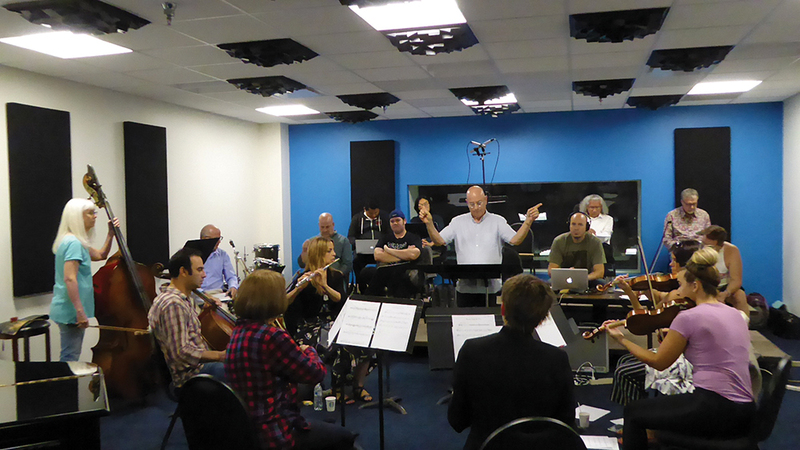 Learn Orchestration This Summer – Free! 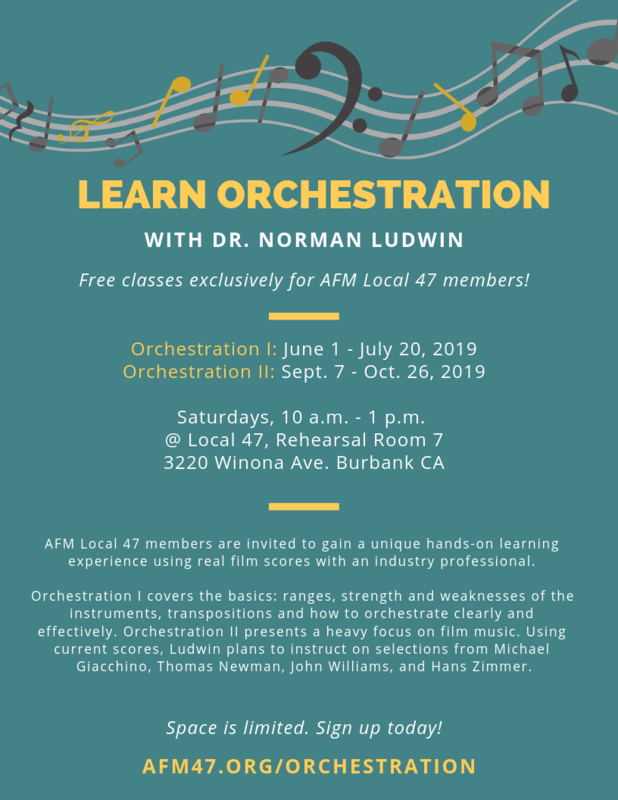 Develop your music orchestration skills this summer with a pair of free classes offered exclusively to members of AFM Local 47. 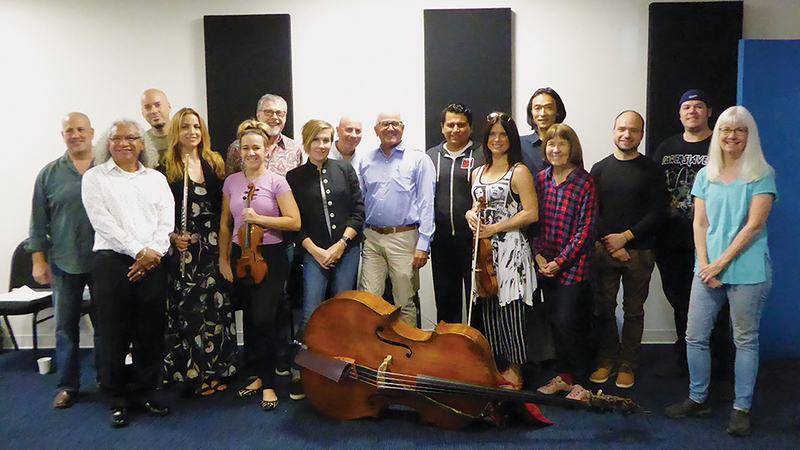 Taught by Dr. Norman Ludwin — an active session bass player, teacher, composer, and orchestrator — the classes offer AFM members a unique hands-on learning experience using real film scores with an industry professional. Focusing on practical knowledge and fundamental techniques, the course is modeled after the one Ludwin teaches at his Extension Film Scoring Program at UCLA. Dr. Ludwin has presented his orchestration classes at Local 47 for the past 11 years, and has also taught courses in film music, orchestration, and 20th century harmony as a guest lecturer in Munich, Toronto, Zurich, Bologna, New York City, Seattle, Boston, China, Vietnam, and Thailand. This fall, between classes at Local 47, he joins the faculty of the acclaimed European Film Academy in Bulgaria. The first of two eight-week courses begins with Orchestration I from June 1 through July 20, followed by Orchestration II from Sept. 7 through Oct. 26. Classes are held in Local 47 Rehearsal Room 7 on Saturdays from 10 a.m. to 1 p.m. Orchestration I covers the basics: ranges, strength and weaknesses of the instruments, transpositions and how to orchestrate clearly and effectively. Orchestration II will present a heavy focus on film music. Using current scores, Ludwin plans to instruct on selections from Michael Giacchino, Thomas Newman, John Williams, Hans Zimmer, among others. Even if you have limited or no experience in orchestration, members are strongly encouraged to attend these classes to learn this important craft that can boost your career. Space is limited, and registration is required. Interested members may sign up online at afm47.org/orchestration or by calling (323) 993-3162. This entry was posted in All News, Events and tagged Dr. Norman Ludwin, orchestration on April 3, 2019 by admin.